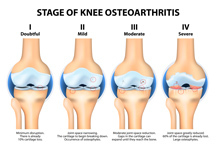 Osteoarthritis is a degenerative condition that is characterized by the loss of cartilage. It most often affects the weight bearing joints of the hips, knees, spine and feet. It can also be found in the fingers and thumb. The job of cartilage is to absorb forces through the joints. It tries to protect the bones from rubbing against each other. As the cartilage starts to wear out or thin down, it loses its elasticity and is easily damaged by injury or use. These changes to the bone cannot be reversed. Osteoarthritis is not a condition that can be “cured”. However, the good news is that it can definitely be managed! A good physiotherapy program includes pain management, stretching, strengthening exercises and education. Osteoarthritis is more easily managed when symptoms are minimal. Starting a good physiotherapy program early on can help to slow down the degenerative process. This can allow you to lead an active and pain free life. If the osteoarthritis is in a knee joint, many times, a custom knee brace can help! It can help to unload the painful side of the knee. This can allow you to have many more comfortable years of activity with your knee. If symptoms have been ongoing for many months or even years, it becomes more difficult to manage. The degenerative process may be more advanced and pain may be persistent. Some times, the pain is so severe, it impacts almost all day to day activities. In this case, joint replacement surgery may be necessary provide symptom relief. Our qualified physiotherapists at PhysioNow can provide physiotherapy treatment for osteoarthritis and help improve the overall wellness and quality of life for those affected by this condition. Please give us a call at 289-724-0448.